I can assure you there aren’t many benefits to being 60, but one of them is that it becomes much easier to cope with the rollercoaster ride that is the life of a City fan. My journey started way back in March 1967 when I was ten. City had just pulled off a major shock by winning 2-1 at Old Trafford in the fourth round of the FA Cup against a United team containing George Best, Bobby Charlton and Denis Law and by dint of constant nagging, crying and general bolshiness I finally persuaded my uncle, who was a regular, to take me to Carrow Road for the next round, against Sheffield Wednesday. This wasn’t my first visit to a football ground (the edifices of the 1960s hardly meriting the title of ”stadium”) because, back in August 1966 he had taken me along to watch Leicester City play West Ham in the season opener, and I well remember both teams providing a guard of honour for England’s World Cup heroes, Gordon Banks, Martin Peters, Bobby Moore and Geoff Hurst. On that occasion I had been safely installed in a seat but because he always stood at Carrow Road he was reluctant to take me along. However, I’d managed to wear him down by the following March and while City lost that day, that first climb up the steps at the back of the old River End terrace and the terrifying surge of the crowd whenever City threatened were pivotal moments for me. While I was lucky enough to be taken to Wembley the following season to watch Manchester United beat Benfica in the European Cup Final, my heart was by then indelibly yellow and green. Over the years my attendances waxed and waned as first university and then the surprising discovery that clubs were actually prepared to pay me to play football (and later manage) meant that I was often elsewhere and could only get to games now and again. However, my passion was never diluted by my frequent absences as heroes came and went and the ground itself slowly evolved into its current manifestation. Of course, not all the changes have been for the better although I don’t miss having to hire cushions to make the experience of perching on the wooden benches of the predecessor of the modern City Stand slightly more comfortable! The eventual disappearance of those cushions also removed a traditional method of patrons expressing their disgust at the fare on offer by tossing them onto the pitch. Probably just as well as we’d currently be seeing games abandoned due to the amount of stuffed fabric on the playing area. Of course, football itself was very different then, with many fans working on a Saturday morning before going to the game in the afternoon, and no sign of the “prawn sandwich brigade” at what was still seen as a working man’s sport. However, while there are plenty of learned articles about the sociological changes to the make-up of football crowds over the years, there’s actually a much more straightforward difference between the game then as compared to now: exposure. Back in the 70s football on TV was a relatively rare commodity, and in terms of City, the only way to see them was either to wait for their turn, alongside the likes of Colchester, Luton and Ipswich (who’d won the league in 1962 but never mention it now…), to appear on Anglia TV’s Sunday afternoon Match of the Week show (which ran from 1962 to 1983) or to get yourself to Carrow Road. No Internet or 24-hour Sky Sports News meant that we had no knowledge of what the players had had for breakfast nor what the current transfer rumours were. In fairness, that wasn’t necessarily a bad thing, with match information only obtainable for those not at the game by turning out in the freezing cold to grab a copy of the Saturday evening Pink’un rather than simply firing up the laptop! Whilst there is always a temptation to look at the past through rose coloured glasses, the lack of saturation coverage of football on TV made the match day experience so much more vivid, although it also had an edge. It was a world away from the family friendly environment that we have today but perhaps that tension added to the atmosphere. Oh, and of course On the Ball City was sung with correct words (its “scrimmage” for heaven’s sake!) and at the correct speed. In my 50 years of going to Carrow Road I have seen some great City teams and some absolute dross. I’ve been exhilarated, and I’ve been apathetic; I’ve been high, and I’ve been low; I’ve been angry, and I’ve been sad. However, what that half century has taught me is that living through the lows makes the highs so much more intense and, more importantly, that there are worse things in life than following a struggling football team. Of course, that may not be much comfort at the moment! Cheers to our friends at Archant for allowing us Robin’s services for this short-term loan – Ed. Hi Robin – great article to read on a gloomy Monday. My youth was basically a London one (White Hart Lane and occasionally Upton Park); I’m exactly the same age as yourself. I remember trying to catch other people’s peanuts as they were lobbed into the crowd, being smuggled in under Uncle Joe’s greatcoat (the turnstile guy must have known what we were doing but let it pass, I guess for a small cut), orange boxes to stand on and the shellfish stall on the way back home. 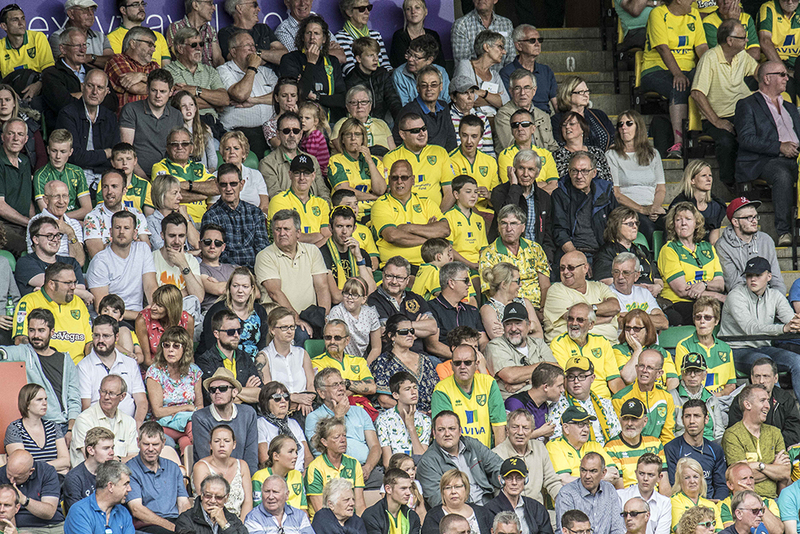 When I was about 10 uncle Wally took me to my first match at Carrow Road – a lemonade and an arrowroot biscuit outside The Kingsway as I vaguely recall. We beat Plymouth but that’s all I can remember – 1967 I think. It truly was a working class sport way back then. A nice piece of nostalgia. Cheers Martin. It was so much more fun in those days! Getting old is no fun at 67 and the only thing it brings is aches and pains after 2 days of being the climbing frame for a 2 year old. Since the late 50’s when I first went to carrow rd we have had some blissfully wonderful times and more dross than I care to remember. Patient is a virture and getting old doesn’t make it any easier you just don’t get so up tight as quickly, and the feeling fades sooner but not the hurt. The one thing that doesn’t go away is the long term fustration with the owners yes we can thank them time and time again for saving the club, but when you get to the position they are now in they should look for away out to keep the history they have helped to make, if this carries on and cities decline continues then before long they will be looked at as being the modern equivalent to the South/Chase and Jones era. I don’t believe in the information being pushed out by the board that there is no one interested in the club, investors are always looking for the next big gamble that is why they are investors but unless you let it be known you are ready to deal then no one is going to make an offer, just look at Newcastle Ashley said last season he wouldn’t sell till they were in the champions league, now he has said he wants out announced the price it will take and got offers. Let the board be proactive in getting help with the finances and if it means dumping the balls up that is Mister Ed talking horse and going to Bowett cap in hand so be it. Ah, lovely memories. My father was never a sports fan but my grandfather had played a bit and took me to my first game in October ’65 – a hammering by Wolves. I certainly remember the cushions – for some reason Mal Lucas was on the end of a few of them in one game I saw. I too went to the Sheff Weds game with a few school friends – a massive disappointment after the Old Trafford win. Having lived in the North West for over 40 years I’ve come across 3 or 4 United fans who were our age and at that game – and heartbroken. I’ve done very little to ease their pain…. I once had the privilege of meeting Sir Bobby, but he’s such a nice bloke I didn’t feel inclined to ask him about it. I wasn’t conscious though that “It truly was a working class sport way back then” if that’s even true. My school was certainly as middle class as they come but frankly at that age – 13 in ’67 – it was not something I was ever conscious of. We loved football, we went to watch it when we could afford to. So did some of our teachers. Simple as that. Great article, Robin – and a nice, if temporary, escape from present anxieties. Shamefully, I can’t remember the exact game that was my first at Carrow Road, but it must have been around 1963 – certainly early in the City career of Kevin Keelan. He – and soon afterwards young Dave Stringer – became heroes, followed by Hugh Curran. Was never quite convinced by Bill Punton on the wing, but it didn’t seem to matter much. Our place was in Division 2 and I don’t remember any of us being too unhappy about it. I joined the angst fest in 1960. Did get taken earlier but was confined to sitting in front of the Main Stand in what my dad called the chicken run………nearly on the pitch…scary. First real memory is going across the Pennines to see City against PNE. Jim Oliver was the quicksilver inside forward and we got a 2-2 draw. My late mother had me trying to shrink to nothing as she bellowed Come On Norwich in her best school mistress voice. Half of Deepdale seemed to look at us……equally scary. I’ve watched City since the early sixties and my earliest hero was Tommy Bryceland. My lowest point was when they sold Ron Davies for a bargain £60,000. He was my all time footballing hero and I still get angry when he is omitted from Norwich City greatest all time teams as he was the best player who ever wore the Norwich short. We were a selling club in those days as well. Oh for a very wealthy owner to come along a take Norwich to the top again while I still have time to enjoy it. There’s nothing worse than losing your heroes before they peak. Ron Davies was in a different class. I believe he still holds the record for the highest strike rate in a season in the top division since the war. Mat Busby described him as the finest center forward in Europe. Ron Davies was at least his equal and I was a big fan of Martin Peters.